Executive lunch /dinner thali. Thali contains: Dal makhani, seasonal veg, rice, papad, pickle, salad, 1 sweet and 2 lacha paratha. All the food items is served from branded fast food corner of Jaipur. GiftJaipur is pioneer in delivery services across Jaipur. 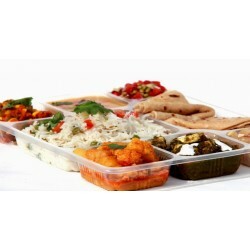 This delicious "Executive Thali" can be delivered across Jaipur except outer areas. Please refer delivery area sheet for your reference.